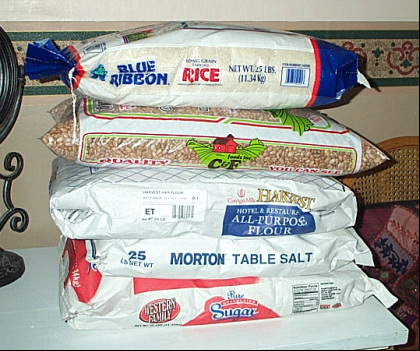 I cannot count the times I have heard people tell me that they know they ought to be prepping, but they can't because they don't have the money to do so, and they don't have the space to store the stuff. I thought it would be helpful if I showed you how much money a one year supply costs, and what kind of space it takes up. It is surprisingly simple to stockpile a one-year supply of things that are cheap, non-perishable, compact, yummy, and nutritious. Just steer away from the pricey MREs and freeze-dried survival foods and stick to the basics found at any grocery store. My containers of choice for his project are filing boxes of the sort found in any business or home office. I rarely use five-gallon buckets because they are so heavy and unwieldy when packed. My food storage system is all about hiding food in unexpected places where it doesn't take up any of my limited living space. It's really hard to hide big plastic bucket. But these file boxes, which come in two sizes, are easy to tuck under a table, behind a couch, beneath the desk, or in a closet, where they blend in with all the other junk in the household and do not arouse suspicion if the home is being ransacked by looters. Be sure to mark them clearly with labels saying "Mother's Medical Records" and "Little Jimmy's Art Projects" and "Honeymoon Photos" and "Tax Receipts, 2009". 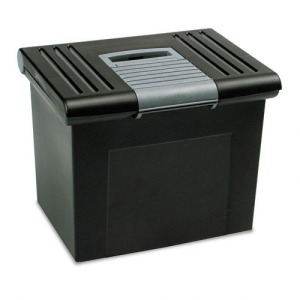 I prefer the metal file boxes, but will settle for the plastic variety, but I NEVER use the cardboard kind, which offer little protection from rodents, insects, or water. I buy these second hand usually for about $1 each. My locally owned grocery store often puts 5-pound bags of instant pancake mix on sale for $5 each. Cooking instructions are "Just add water" which will be appreciated in a SHTF scenario when you're not going to be able to track down other ingredients. 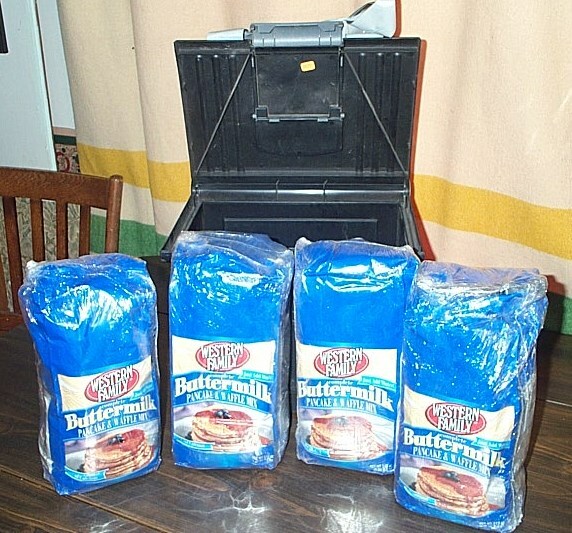 A five-pound bag of pancake mix will make 75 servings of pancakes, with a serving defined as three 6-inch pancakes. Therefore, five of these five pound bags will be enough to feed one person pancakes for one year, for a total of $25. A half-gallon of cheap corn syrup-based pancake syrup runs $10 in my town; corn syrup will last for decades. Maple syrup will also last indefinitely but it's considerably more expensive than corn syrup. Because my project is to see how cheaply I can purchase food for a year, I'm sticking with corn syrup. Four of the 5-lb sacks fit nicely into one of the larger size file boxes. A second file box holds the fifth sack of pancake mix and the three half gallon jugs of syrup. If there are berries or fruit of any kind growing nearby, those go into the pancakes, and the pancake mix can also be used to make fruit cobbler. I now have breakfast for 375 days for a total cost of $55 and a total space of two file boxes. I shrink-wrapped these for extra protection. Eventually I'll get around to storing them inside mylar. 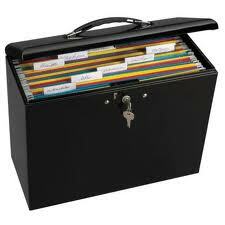 The file box will be sealed shut with duct tape. If you've got any kind of berries or fruit growing near you, add those to the pancakes. I really love quality soup mixes. Bear Creek makes some of the best. These soup packets are also a "just add water" deal, and each packet makes a huge pot of thick rich hearty soup with the addition of eight cups of water. There are about 20 different varieties of soup and I've included some of each. 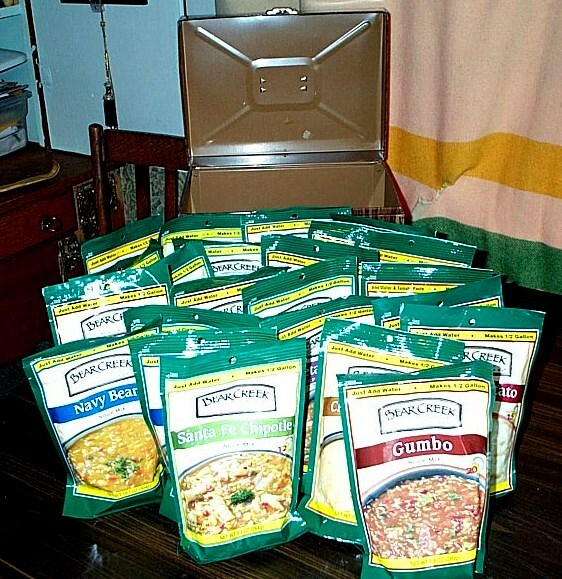 I can fit 23 soup packets into a single large size file box. Each packet makes eight servings of soup. If garden vegetables or game meat are available, that will stretch things nicely. The normal price for a soup mix is about $4 or $5. The Wal-Mart price is about $3. I lucked into a two-for-the-price-of-one sale and picked these up for only $2 each. Two bucks for a big pot of soup is a screaming deal. I packed two large file boxes with soup mixes and that will provide 368 lunches for a total cost of $92 using a total space of two more file boxes. Spaghetti is absolutely one of the cheapest foods available today. It stores well for decades, requires only water to cook, and is a perennial favorite among children and adults alike. 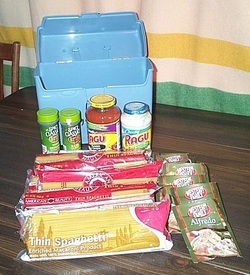 Spaghetti noodles often go on sale for 50 cents for a one-pound package, so it cost me only $24 to purchase 48 pounds. Each pound of spaghetti makes 8 servings. I store my spaghetti in the smaller file boxes because they are so easy to hide around the house in the unused nooks and crannies of closets and corners. Each file box holds 12 lbs of noodles, along with a selection of sauces in glass jars (tomato sauce keeps better in glass than in metal cans) as well as a fat bundle of sauce and seasoning packets which were on sale four for a dollar. I also included herbs and spices that I picked up for 50 cents each. If gardening is possible, tomatoes are among the easiest things to grow, and that will supply fresh spaghetti sauce. I now have four small file boxes, each containing 12 lbs of noodles and about $5 worth of sauces and seasonings. Therefore, the total outlay for 384 spaghetti dinners is a grand total of $44, and the total space taken is four small file boxes.